The Flatiron Hotel is a newly built hotel in 2011 in a landmark building. It has a total of 11 floors. The guest rooms are floors 3 to 10 with a total of 64 rooms. The Rooftop penthouse is located on the 11th floor. The Bar and restaurant are situated on the lobby and mezzanine levels. The hotel is non-smoking. 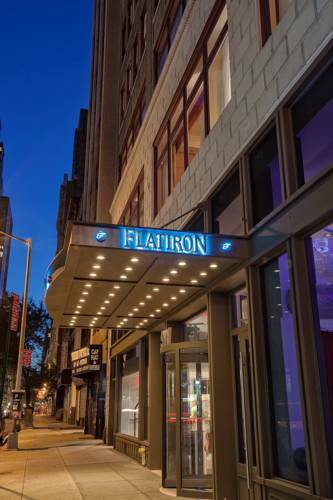 The Flatiron Hotel is comfortably located in Chelsea in the heart of NYC. You can easily find yourself at Madison Square Park the Empire State Building Madison Square Park and even Macys within ten minutes. We are steps away from various public transportation stations that will take you to your destination in NYC. The top-floor Penthouse with a spacious wraparound terrace offers over 2000 sq. ft. of prime NYC space. Host parties, meetings, and functions of up to 150 people in one of the finest settings in NYC.